The basis of the current issue German combat webbing system. 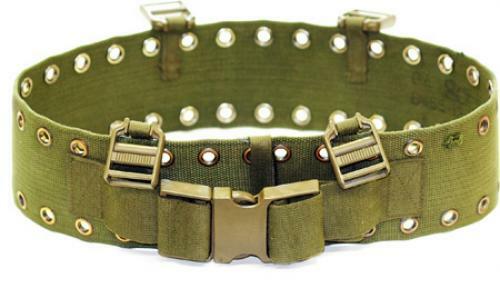 You can build your own set on this, all you need is this belt and some pouches. Very popular base for making your own pulling harness for a pulka-sleigh. Yeah, it's wide. 10 centimetres or 4 inches. That's what makes it so comfortable and a stable platform. Two rows of grommets are large enough for your own paracord contrivances. The plastic hardware is incredibly tenacious POM, maybe the German army learned their lesson from early 40's winters because this thing actually works and lasts even when the temperature drops. There's a big buckle for closure and adjustment, and four smaller ones for attaching a harness. The sizes are the actual length of the belt measured by us. Take the one that is closest to your actual waist circumference. If in doubt, take the shorter one. Very wide belt, feels nice on your waist. Unfortunately not very adjustable, so you have to find exactly the right size. If it fits with a jacket on, it may be too wide without a jacket. This is the biggest disadvantage and makes it pretty much useless for me. As Varusteleka says, this can be used as a base for a pulka-sleigh harness. If you want a woodsman belt for your pouches etc, I suggest you find something else. Excellent. This will not fit the belt loops of your skinny pants Nancy. It is also not adjustable for more than about 5", so you may need to learn how to read a tape measure before ordering. If you know you need a nice wide belt for cheap, this is it. I ordered mine according to the description and got one that fits perfect over trousers and will adjust over several layers and a Parka. Onhan tämä aikamoinen laitos. Tosiaankin pitää valita oman vyötärönsä ympärysmitan mukaan, säätö kun toimii tästä 20? cm isommaksi mutta ei pienemmäksi, näin on sitten säätövaraa takille ym. romulle. Pikalukon hihna täytyy pujotella kaikista mahdollisista väleistä pariin kertaan jos ei halua niiden heiluvan vapaana ympäriinsä. Omassa yksilössäni hihnan päät oli särmätty vihreällä germaaniteipillä. Tämä ei noin muuten ole mikään sekunnissa puettava systeemi, vaikka tässä pikalukko onkin. Leveän osan on tarkoitus asettua hieman limittäin (ainakin omastani löytyy luuppi jonka läpi leveän osan toinen pää pujotetaan) ja pikalukko sitten kiristää koko komeuden. Valjaiden solkien väli on aika kapea ja niistä näyttäisi menevän max. 30mm hihna. Inexpansive and tough as nails. I made it my Norwegian rucksack waistbelt, using cordage to attach it through the many holes, and it's almost confortable (it being so large). Since I put it upside down, the buckles I can use to hang stuff. Oh, and BW pouches being so dirt cheap but durable, I can just have my canteen pouch on one side and a multipurpose pouch on the other. I use another one as my airsoft battle belt with the braces. Have it tweaked properly takes ages since it's not possible to have the straps slide without taking them out of the buckle partially, but at least nothing moves once it's done. Kind of an outdated system, but perfectly serviceable.